A black and white portrait photograph of William Warren Sr., (1800-1887). 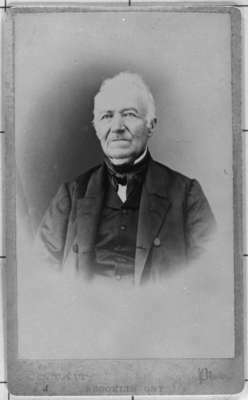 William Warren was born at Kinsale, County Cork, Ireland, on October 18, 1800 and came to Whitby Township with his brother John Borlase Warren in 1821. They farmed on the third concession for about a year and opened a store at Hamer's Corners in 1823. He married Clarissa Lynde on March 25, 1824 at Whitby Tonwhsip and they had a family of 16 children. In 1824 William Warren moved to Darlington Township where he operated a store and mills until he was appointed Customs Collector at Port Whitby in 1843. He held this job until he retired in 1875. William Warren died at Whitby on June 26, 1887 and is buried at St. John's Anglican Cemetery, Port Whitby. William Warren Sr., c.1875, C. Tait. Whitby Archives 31-009-245.